Just before Christmas we were introduced to a proud Lancashire-based company called Sofas by Saxon. As the name suggest they make sofas but have also expanded in to producing, rugs, throws and cushions… all made in beautiful Bolton. They sent us a fantastic plaid patterned throw which, as luck would have it, looks great on our living room chair. A family business since 1982, Sofas by Saxon are likely best know for producing Chesterfield-style sofas but have, what appears to be, an endless range of living room furniture in every conceivable colour, and even undertake bespoke work. It is clear that their 75 strong manufacturing team are kept pretty busy. The throw they sent to us as a sweetener for writing nice things about them (which we would have done anyway… but don’t tell them) is made from 100% British wool and comes in 7 colours. It is fair to say that they are all muted country tones and 5 of them are plaid. 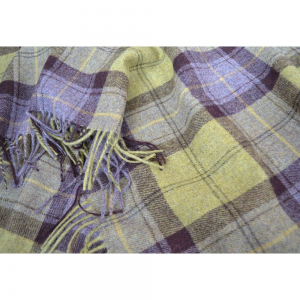 This is perfect for us as we are very traditional in our tastes and that’s why, when asked to choose one, we opted for the ‘Blackberry Crumble’ which features olive tones with a hint of purple (check it out here: https://www.sofasbysaxon.com/genuine-wool-throws-p357). Strangely, we have quite a collection of British made throws and at £130 the latest addition is the most expensive. That being said it is the best quality by some margin and well worth the nominal extra spend. It is also slightly larger then the others too, which is an advantage when you need to fit the whole family under it on a cold winter night. If the throw is anything to go by their sofas, I imagine, are going to be top-notch too. I am a little partial to a Chesterfield and staring at just £729 (sale price so get in quick) I would say that they are a great option for our next sofa. It is clear that these guys are proud to be a British manufacturer and it is nice to see that they are heavily plugging the British made = quality piece throughout their literature. So, in short, here we have a great British manufacture making quality stuff in the UK at a decent price. What more can you ask for? Oh, and here is a video of some sofas being made… enjoy! We have been lucky enough to have recently been sent a beautiful British made cushion from Evans Lichfield. Utilising the the work of a talented stable of British artists, Lichfield Evans specialise in fabric cushions that would feature wonderfully in any country house. The company currently employ 50+ people in their West Midlands factory and create a product of outstanding quality (especially considering the price). Their cushions seem to me to be within a pretty reasonable price bracket – between £10 – £20. The sample we were sent is made from 60% cotton and 40% linen and comes filled with a fibre-filled inner. 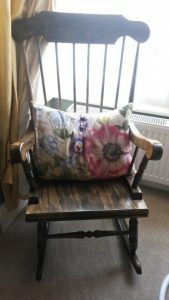 It is a perfect sofa-size measuring in at 40cmX60cm and features large pink, purple and blue flowers printed to one side. Rather spookily they decided to send us a cushion that seems to fit our home decor pretty well. However, I am unable to find the same design on their website so am unable to tell you the artist. While on the subject of their website, Lichfield Evans suffer from one of our pet hates – a great British made product underpinned by a poor online offering. Thier own website does not allow you to buy online but after some further investigation I was able to find an Amazon account for them which appears to stock much of their range (click here). While there range might not suit all tastes, if you are going for a classic British country house look their cushions could be just the thing to finish off your living room. We were contacted recently by Farmers Choice, a company founded in 1984 bringing British free range produce from dirt to doorstep, to review some of their boxes of farm fresh goods. They started as an online butcher and have developed their ranges to include fish, groceries and all sorts else. Being no strangers to veg boxes, it has been no secret that we have managed to save about 20% on our food bills by using such schemes – So we were keen to see if Farmers Choice offered us similar savings. We received two boxes from Farmers Choice, the Sunday Roast Chicken pack and the Weekly Essentials pack. The meat arrived mostly frozen in one box, with some extremely clever packaging to keep it perfectly fresh, consisting of dry ice packs and recyclable wadding. We had a whole chicken (with the giblets which the cat devoured! ), chicken stir fry pieces, beef mince, 6 slices of thick cut bacon and some lovely thick cut ham (this was chilled not frozen). I have to admit that most of our meat usually comes from our local farm shop so we are not used to it being frozen however this was a minor thing. The quality of the meat as a whole was excellent and we were all especially impressed with the flavour of the whole chicken. The fruit and veg was equally well packed with a great message on the inside lid…. Enjoy! Included in our fruit and veg box was; a packet of Isle of Wight tomatoes, a punnet of mixed salad leaves, leeks, parsnips, carrots, apples, cauliflower, swede, a large bag of potatoes and a chicken roasting kit from Potts. I have to say the produce was all really fresh and I was particularly impressed with the quality of the salad, which is notoriously hard to transport and keep from bruising. While the majority of the produce was UK grown (we were very impressed with the Isle of Wight tomatoes in April) some of the produce was not, specifically the apples. Our favourite inclusion was the chicken roasting kit from Potts which is something we would never have normally bought but would absolutely buy again. It gave us a succulent and great flavoured chicken, plus the gravy and sauce in the pack were also really delicious. 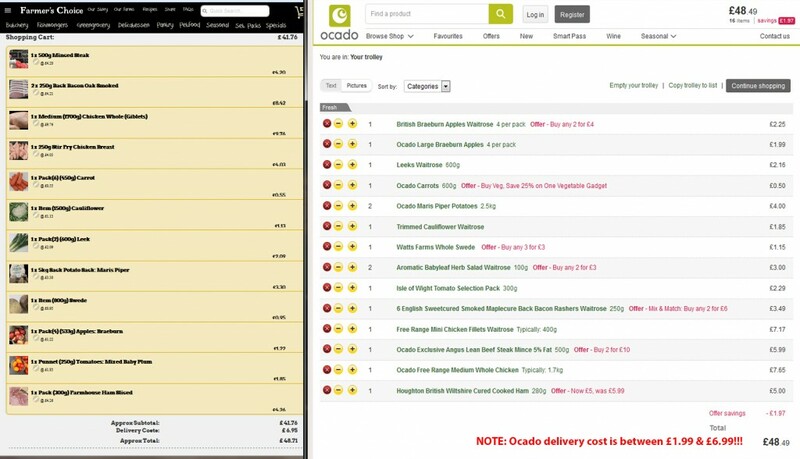 In terms of cost, we looked on Ocado to create a comparable shop (see above). This was not a strictly direct comparison as some of the weights of meat were not available, however we found that we saved around £8.00. This is great when you know that the added bonus of Farmers Choice is that you are supporting local farmers and arguably better quality produce. Ultimately, saving money on your shopping is possible by using veg box schemes like Farmers Choice if you shop in a particular way. If you tend to stay away from processed foods and try to pick the organic option then you are really going to save loads of money. However, if you favour ready meals and convenience foods then this is where the supermarkets come into their own. I think it is safe to say that we were very impressed with Farmers Choice and the slick service they offer. They have a wide variety of products and a great ethos of supplying British free-range meat and produce. If you would like to visit their website and try them out yourselves visit www.farmerschoice.co.uk! 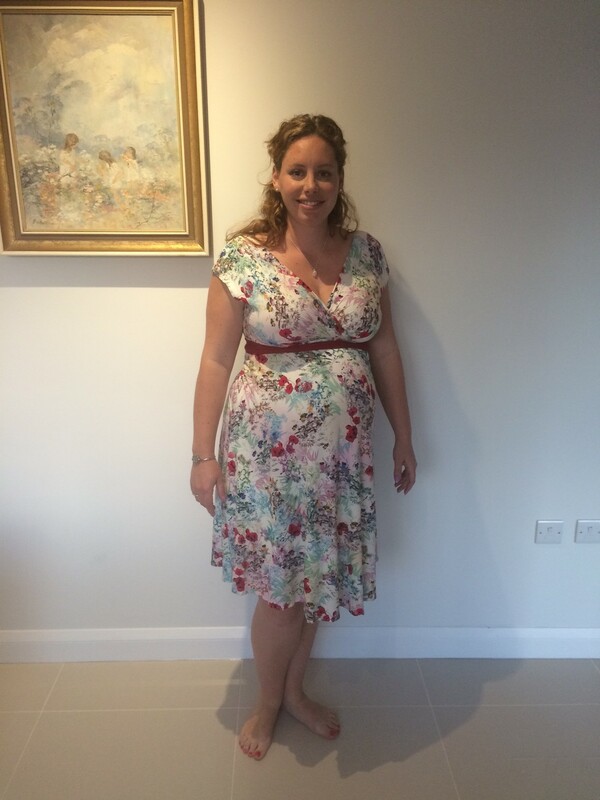 A little while back the fabulous people at Tiffany Rose sent me one of their exquisite dresses to review. It was not easy to stop myself from immediately putting it on and wearing it just about everywhere but I managed to hold off, saving it for our fabulous celebration of all things British made, The British Family Fayre. When it first arrived, the care that goes into every dress was evident from the beautiful box and packaging. While the dress is relatively simple in design, the construction and the care to flatter and enhance the pregnant shape was clear. 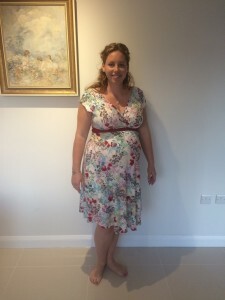 The dress is fully lined which really adds to the comfort and also again to the shape on the body as its not everyday that I would feel confident enough to wear a relatively clingy dress like this. I must admit that the comments came streaming in about the dress and in particular the beautiful fabric, from those who visited us at the fayre and since then I have worn it to work where even the children at my school commented on how pretty I looked! Tiffany Rose are a British brand through and through, designing and manufacturing every dress in the UK. They have also started sourcing the jersey fabrics from British mills and are helping to keep the fabric mills in the Midlands whirring and giving the local areas vital jobs. For those not needing maternity wear, their stunning dresses are also available without the maternity extras on their sister site Alie Street, London. Here their passion for beautifully made clothes continues without needing to accommodate a bump and I for one, will be back there for dresses once the newest Bradshaw is with us. If you would like to check out their full range the websites are http://www.tiffanyrose.com/ and http://www.aliestreet.com/ respectively. I am very excited that I might also get to go to the workshop sometime soon to see their manufacturing in process and as soon as we are all sorted I will post more! INHOUSE make a small but increasing range of handy home innovations which are are currently stocked exclusively in Lakeland stores. What is more, I am proud to say that all of their products now display our free to use made in Britain logo. All of INHOUSE’s products are designed by owner Steve Britton-Williams, who, it must be said, is big supporter of British manufacturing. Once every few months James gets a call from Steve and the two of them spend a good deal of time setting the world to rights. Steve has been promising to send us some samples for about 2 years and recently came good. 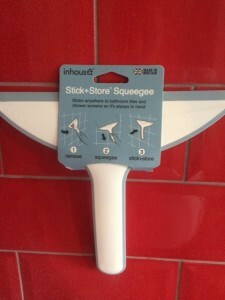 He provided us with his redesigned squeegee and some of his ingenious stick and store shower pads to review. The focus of this review is the squeegee. It looks like many others that you might have seen, or have used, but with one distinct difference. The INHOUSE squeegee has little suckers on the front which allows it to be conveniently stored on (again) any tiled or glass surface. I imagine that there is little difference from how effectively one squeegee works to another. The concept is pretty simple – a rubber blade attached to a handle (Steve might disagree). So, then we need to look at what sets this one apart. It does looks really smart and feels rather nice in the hand but again this is perhaps no different to other similar products at a similar price point. The real sell for this device is the ability to store it utilising the suckers. So how well do they work? We have tested the squeegee (and the stick pads) over the course of the last 6 weeks or so. The power of the suckers, we found, lasts reliably for about 3 days on tile and little longer on glass. It has to be mentioned though that you need to read the instructions for achieving a lasting stick. We found that we ended up using the squeegee after every shower, in order to prevent a build up of lime scale on our glass shower screen, so this is where we stored ours. This regular use has meant that there have been very few occasions where it has not remained in position when we have come to use it again. In terms of price the INHOUSE is about middle of the range in Lakeland, where Squeegee’s start from £3 and go up to £15. So, in terms of price I do not think that it is too bad at all. We always say this but it is actually finding the mundane everyday items that are made in Britain that really excites us. Finding things that you would expect to be made in the Far East but, generally for reason of the manufactures passion and commitment to quality, are made here. The INHOUSE Squeegee is one shining example of this. Note: You know when you use a word so much that it loses all meaning and begins sounding alien to you?… Squeegee! Trunki are a true success story for British manufacturing. For those not in the know (or have not been to an airport recently) – a Trunki is a ride on suitcase for kids. 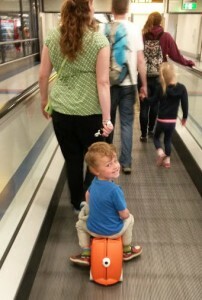 Lucan got to try his out for the first time recently, at Gatwick airport, on our first foreign holiday in 5 years. After a number of years of being produced in China the first Trunki to be made in the UK, called the MK5, rolled of the production line in late 2012. Despite owning two of them, our holiday to Italy was the first time Lucan had an opportunity to really put a Trunki through its paces. 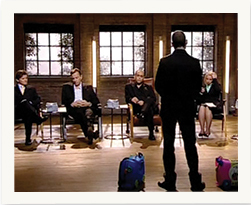 The company came to prominence in a 2006 episode of Dragon’s Den when, designer Rob Law, famously rejected £100,000 investment from Richard Farleigh. The product that was featured in the program was made in China, as they were for the following 6 years. However, Rob spent 2 of these years completely redesigning the product so that it could be made in the UK. They have now sold over 2 million cases worldwide and it is unusual to visit an airport and not see a child on one. I imagine that many of the Dragons are now kicking themselves. From outward appearances you would be excused for thinking that, as luggage, the Trunki might be less than worthless. In fact it measures just larger than your standard hand luggage allowance. This caused some initial panic in the Bradshaw household but after some research we found that most airlines (including Thomas Cook who we flew with) actually mentioned them by name as acceptable under their hand luggage rules. Now confident that we would be ok, Lucan filled up his British made tiger Trunki with everything he would need for 7 days in the sun and off we set. Airports are a stressful place, often made worse by bored children. The Trunki is the ideal antidote to this. It is highly practical but also tremendous fun. Upon arrival at Gatwick Lucan immediately wanted to be pulled on his Trunki. The highly polished floors, that airports the world-over are fond of, make the ideal trace track for a kid and his Trunki. You can really get up some speed on them. I even had the situation, while I was pulling him along, that he was actually overtaking me – legs in the air and big grin on his face. As the person responsible for both pulling Lucan along and dragging a large roller case, steering the Trunki took a little bit of practice. More than once he and Trunki ended up under the legs of some unwitting passer-by, something Lucan found immensely funny. Once you get over having to apologies to strangers for tripping them up, the Trunki is great fun for the adults too. 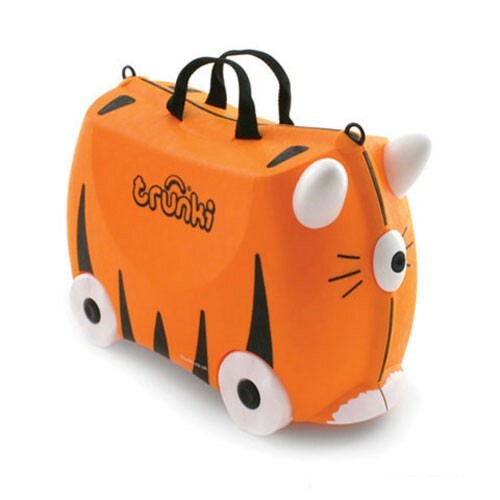 I mentioned earlier that Lucan owned 2 Trunkis – the first is an earlier Chinese built one and the tiger Trunki, we took on holiday, was a later British built one (Kindly gifted to Lucan by the good people of Trunki themselves). The differences between the two are very subtle but most noticeable is the lack of metal components in the British made version. Trunki explain that this is actually a design feature that allows them to completely recycle them and makes the replacement of parts easier. One might expect that replacing metal with plastic might actually make the product weaker, but having them side by side, I can honestly say that this is not the case. I would like to be able to say that the British one is of clearly superior quality but, if I am honest, there seems to be little other discernible difference between the two versions. Both are excellent quality and feel equally robust enough to deal with anything a family holiday can throw at it. In short, the Trunki is a ‘MUST HAVE’ for any family with young children planning a trip abroad. It made our travels far easier and the fact that they are now made in Britain is just the icing on the cake. We are often given some weird and wonderful things to review and Brill Cleaner is both of these things. While we may not be a usual audience for a commercial cleaning solution, we are happy to put any British made product through it’s paces. 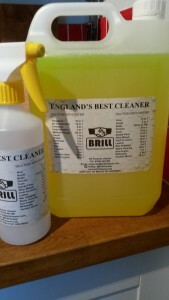 Brill cleaner is an economical, do all, budget cleaning product for businesses. It comes in a minimum 5ltr bottle but you can buy it online in quantities up to 500ltrs. What is more – this stuff is delivered in concentrate. Meaning that, depending on the application, you need to dilute it with water by as much as 20:1. As you might imagine, the 5ltrs provided for us to review is likely to last a very long time in a domestic setting. Brill seem pretty proud of the fact that create just one, no nonsense, product. It is sold in wonderfully no frills packaging, with literally no expense spent on design. Although, they do boldly announce that it is ‘England’s best cleaner’ in large type right on the bottle. They also claim that it can be used for just about any cleaning job, from windows to ovens. Brill’s business model seem to be that all of their budget is best allocated to producing a top quality cleaner that is delivered at the best price point, at the cost of any finery. In fact they claim that 500ml of ready to use solution costs around 28p. If you consider that most supermarket brands roll in at around 10-20 times that cost there are some, not insignificant, saving to be had… but is it any good? The short answer to this, you will be glad to know, is yes! It works about as well as any brand of household cleaner I have ever used for all of the jobs we tested. This included using it to clean our rugs, James’ motorbike, a tiled floor, a wooden floor, our shower, our kitchen and more. Using this product does make me think about all of the money I might have wasted over the years on other branded products.Is it that we are all being taken in by the marketing??? Surprisingly, in having stood up to our rigorous testing, Brill cleaner contains no acid, ammonia or bleach. I am not sure what else it could contain but Brill also claim that it is also fully biodegradable. So, where is the catch? Well, it is fair to say that Brill cleaner makes absolutely no attempt to hid the smell of whatever magical ingredients are within. It does not smell bad but it certainly does not smell like a pine meadow, apple blossom or whatever fragrance is in your usual domestic cleaner. It smells, perhaps unsurprisingly, like cleaning fluid. This might be enough to turn off some potential domestic users, but not us. I find the smell reassuring, almost an affirmation that I am actually getting something clean. However, thankfully, the odor does not tend to linger so I am happy to carry on using it until I finish the whole bottle… then buy some more. 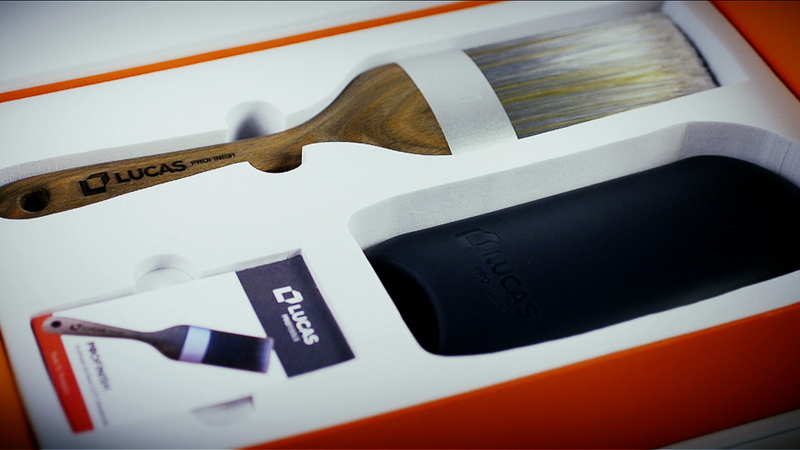 I was kindly invited to the product launch of the Lucas Pro-Tools ProFinish paint brush back in December last year. It was a glittering affair at the McLaren factory and so certainly a memorable evening. I was also given a sample brush to try at the party and have been using it consistently for the past 7 months. This is the most field testing we have ever done for a review of a British made product. The first thing to address is why is has taken me so long to produce this review. 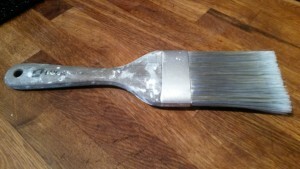 The issue is that the Lucas Pro-Tools paint brush is so damn expensive. At £60 each, I have to admit, I was struggling to justify the cost… but I think I now might be able to. The first thing to note is that this brush is not really meant for enthusiastic amateur DIYers like me. It is a proper professional tool. My usual approach to paint brushes is as a disposable commodity. As such, if I spend £10 on a pack of 3 brushes I feel hard done by. So, I am really not the target market for this product and this is perhaps why I wrestled over the cost for so long. The last few months have given me plenty of opportunity to test the Lucas to the limits. I have built a conservatory, added a loft conversion, redecorated the kitchen and touched up the paint in just about every other room in the house. The Lucas has been with me every step of the way and, while it is not looking as fresh as it once did, it is still as functional as when I opened the box. The one thing I cannot quantify is how much of its current good form is down to the construction and how much is down to my reverence for it. I look after this brush better than any tool I have ever owned. Each brush comes with it’s own little comb which you are advised to run through your brush after every use. I diligently do just that, which actually makes cleaning far easier, and tuck it way in its supplied solid plastic cover. I am sure that this routine goes a long way to preserving the brush but let’s not underestimate the part that the quality of construction play in all of this. Lets make no bones about it, this is the best paint brush money can buy (or at least I have ever used). It applies paint evenly, cuts in perfectly and never leaves bristles behind. It is a genuine pleasure to hold in your hand and it feels rock solid. With a pure beech handle and seamless aluminium ferrule (the bit holding the bristles in) the ProFinish comes in a beautiful presentation box complete with a comb, guard cover and instructions. So, is it worth the money? I surprise myself in saying this but I think it might be. It is only after all these months of use that I now understand the value of a good quality paint brush. If you are going to use it once or twice a year then the investment in the Lucas is likely not going to be a good one but if you are a regular user, or indeed a professional, then I can see how this would start to pay for itself after a while. Ultimately, painting is my least favourite DIY job. The fact that the ProFinish has made it significantly less painful is actually worth a lot to me. I am a whisky fan, especially those from Islay, the southern-most island of the Inner Hebrides, off the west coast of Scotland. My bucket list certainly includes a distillery visit. So, imagine my joy at being offered a chance to sample and review 5 new whiskeys, including one from my favourite Islay distillery – Laphroaig. As well and the much anticipated Laphroaig, the samples I was sent included 2 new offerings from Macallan, one from Highland Park and the last from Ardmore. NOTE: It is worth stating that I ‘sampled’ all of these fine single malts in one sitting and started off making quite sensible tasting notes. By the end my devout professionalism was thrown out of the window. So, basically I am writing this based on what is now a rather sketchy memory of my enjoyment of these very fine drams. However, I do recall enjoying every single one of them in their own way. The Macallan Gold is called because of it’s distinctive gilt hue and it is bottled to showcase the single malt’s natural colour. This rather pleasant whiskey has notes of vanilla followed by dark chocolate, with lingering floral and light oak notes. I must admit that it is not my favourite of the bunch I tasted as I look for a real punch of peat from my whiskeys. This is available in multiple retailers including Tesco, Asda, Morrisons, Sainsbury’s and Waitrose (RRP £38.95). The Macallan Amber is a smooth and warming dram offering hints of toffee apple and cinnamon flavours and is notable for its startling amber colour. Again, this is a very fine whiskey but not quite for me. 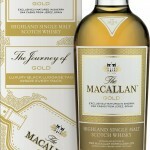 The Macallan Amber is available at specialist whisky retailers including The Whisky Shop (RRP £48.95). 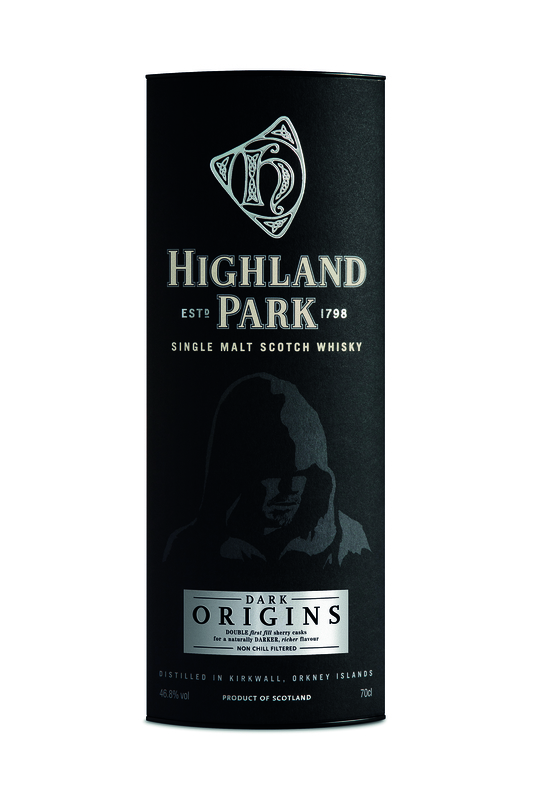 The latest edition to Highland Park’s core range, Dark Origins offers a naturally dark, rich flavour with sherried spice, a chocolate twist and the signature sweet smoke. I was surprised to find that this was actually my favourite of those tasted. It does not fit the traditional profile I would go for but was really rather good. 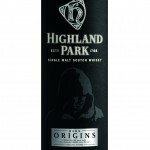 Highland Park Dark Origins is available to purchase from specialist whisky retailers (RRP £65). 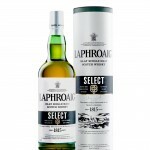 Laphroaig Select has the unique peaty character offered in all of Laphroaig’s whiskeys. 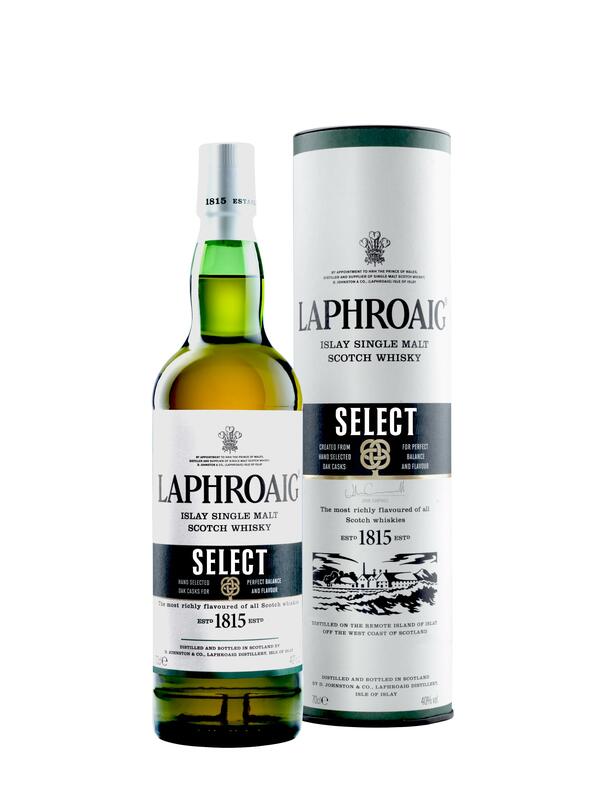 The latest addition to the portfolio, Laphroaig Select, offers a deep, smoky taste yet surprises the palate with a gentle sweetness. I was most looking forward to this one and indeed it did not disappoint. However, I still find the 10 year old Laphroaig to be the best for me. Laphroaig Select is available in multiple retailers including Morrisons, The Whisky Exchange and Master of Malt (RRP £34.99). The Ardmore Legacy is a great introduction to peated single malt whisky. With notes of creamy vanilla, followed by smoky charcoal and savoury spices with a pleasant smoky taste, The Ardmore Legacy is a full-bodied and smooth dram with a dry, spicy and long-lasting finish. I perhaps enjoyed this as much, if not more, than the Laphroaig. 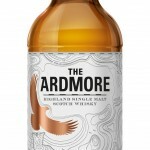 The Ardmore Legacy is available in multiple retailers including Tesco and Morrisons (RRP £29.99). So there you have it. If there was ever proof that writing a blog had its perks – my 2 cents on some of the latest drams on the whisky market. Of course, with Fathers day just around the corner there are now a few more options open to you. We were recently contacted by Utensa who wanted us to do a review of their British made bakeware and, as a keen cook, I was more than happy to accept. 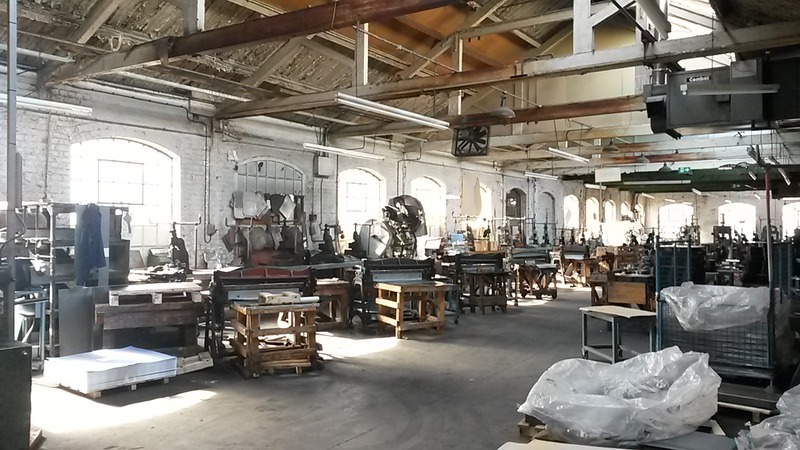 Their baking tins have been manufactured in Birmingham for the last 125 years and, although the last few years have not been easy for them, they have stuck to their commitment to provide quality products at favourable prices. They sent us an oven tray, an 8″ loose bottom cake tin and an enamel roasting tin to review. First impressions are that they are certainly better quality than any other bakeware in the house, most of which is far beyond the point of providing any reasonable level of non-stick. What they provided is clearly very solid but not too heavy. Utensia themselves suggest that the weight of bakeware is not a good indicator of quality as a light weight product offers a far more even bake. This might be contrary to expectations but the key is in the durability of the coatings and how they are applied. The good people at Utensa are keen to point out to us that all of their products have a double layer roller-coat application of non-stick to ensure even coverage and extended life expectancy. In fact they are so sure of the longevity of their tins that they claim that they last up to 8 times longer than typical Far East imports. I also like the clear labelling giving simple instructions on the maximum temperature recommended for each item as well as the size and the best news, that it could all go in the dishwasher if necessary! Excited by my new kitchen ware I used all three pieces in one day. First deciding to use the baking tray to make some lemon curd biscuits before then using the round loose bottom tin to make a pizza rustica. Both of these are from one of my most used cook books ‘How to be a Domestic Godess’ by Nigella Lawson and are lovely recipes. The enamel roasting tray was used for a super British rib of beef for our Sunday dinner along with the roast potatoes. Normally the trays I use for this get ruined pretty quickly as the high heat tends to make for a pretty trashed tray bottom. The Utensa roasting tray, however, held up brilliantly even going on top of our induction hob to make the gravy (something very very few pans can do)! In short all three trays held up to the abuse we hit them with on the first day and still look like new nearly 2 weeks on. This is helped by the fact that they wash like a dream. In short Utensa prouce a fantastic product with a fantastic story, here’s to the next 125 years! !